REUTERS/Heino KalisStock market bulls are back in control. Something has changed in the stock market. In early October, bond yields fell, stocks dropped, and people began throwing out comparisons to the violent stock market crash of 1987. And as the market begins to get more confidence, to display more hubris, the “tell” that we might be at a top will be found in the price of gold. “[T]he big hubristic ‘tell’ will be gold,” Hartnett wrote in a note to clients on Friday. 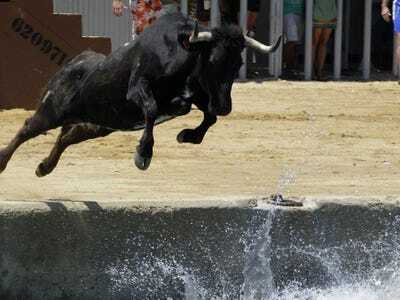 “A sudden gap lower in the gold price to below $US1,000/oz should coincide with the final thrust higher in stocks, both indicating capitulation of the ‘stubborn bears’, the end of the ‘melt-up’ and the next opportunity to get tactically bearish. Late last month, the Bank of Japan announced additional stimulus. And just last week, European Central Bank president Mario Draghi said the ECB would look to increase the size of its balance sheet and that ECB members were unanimous in pushing for more stimulus if needed. Hartnett sees 2014 and 2015 as “transition years” after the huge bull market seen from the post-financial crisis bottom through 2013. 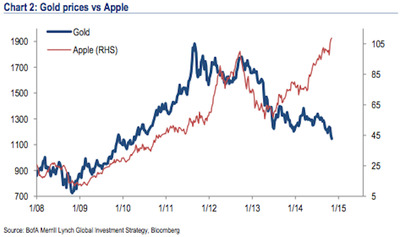 In his note, Hartnett highlights a chart that he’s been referencing in notes over the last several months: Apple’s share price vs. gold. The iPhone maker’s stock is currently near record highs. Gold is at multi-year lows.